I am sure I’ve shown this drawing before as my artwork of the week but it was a drawing I always liked and it does have a tenuous link in that we’ll be heading back up north for a break soon. We’re not going to Assynt again this year, but a little further north …well, about as far as you can go north on the mainland! We’ve rented a small cottage right on the coast not far from Bettyhill. It looks a wonderful spot on the map and it is going to offer some very different walking country to that of Assynt. When we go I’ll not be taking paints with me, just sketch books and an array of pencils, graphite sticks and pens. 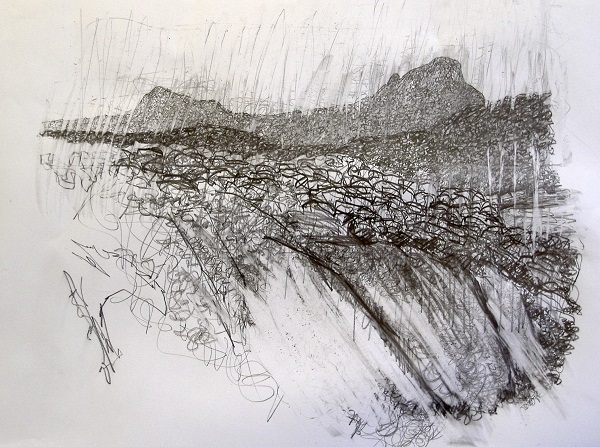 I’m hoping to get some very different drawings done ….of the coast line and the wild and large horizons of the flow country. It will of course as usual, all depend on what the weather is like while we’re there. So then, I’ll be keeping my fingers crossed for a dry few weeks and with a bit of luck I’ll come back with some future ‘artworks of the week’! In the meantime, I hope you enjoy seeing this piece once again. << Previous Post: A short piece about very little….but with one bit of good news.